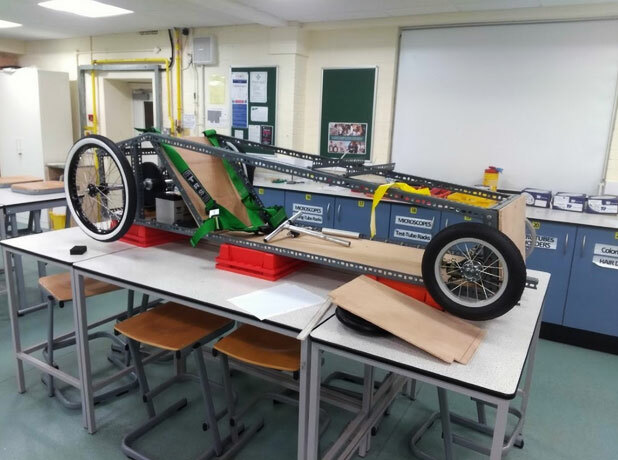 A team of BHASVIC physics students has successfully built and raced an electric car as part of the national Greenpower competition, winning an award in the process. 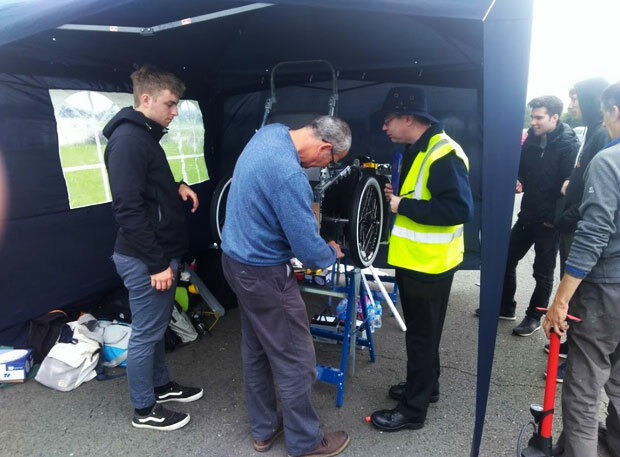 Greenpower is an excellent opportunity for students to experience a real engineering challenge so when Phil Edwards from Weald Technology offered to support a team with 3D CAD training, specifically for Greenpower, it was too good an opportunity to miss. 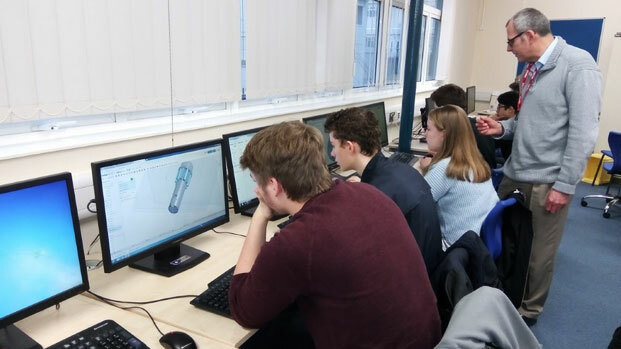 In January 2017, 30 students joined the course which showed how to build a virtual 3D gearbox assembly. After several months of CAD training and planning, we addressed the problem of where, when and how we were going to build the car. With the college science labs in full use during the day, the only option was to build the car during the summer holiday. 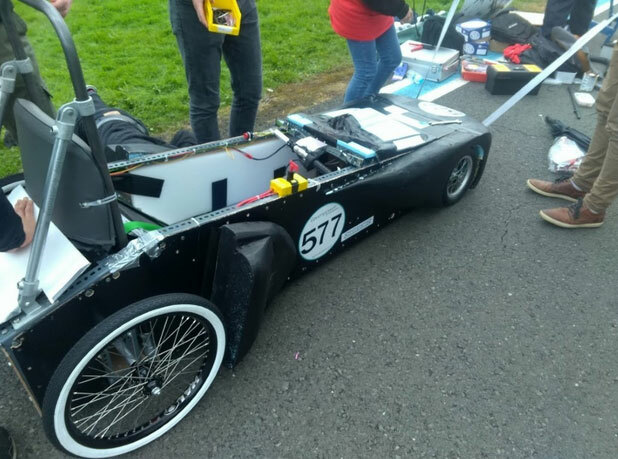 This gave us approximately 6 weeks to build the car from scratch so that it could be ready for the first race at Dunsfold Park in early September. To keep costs down, the team made good use of scrap materials and recycled components. The front wheels and steering were adapted from a recumbent trike and the chassis was made from Dexion, commonly used in steel shelving units. 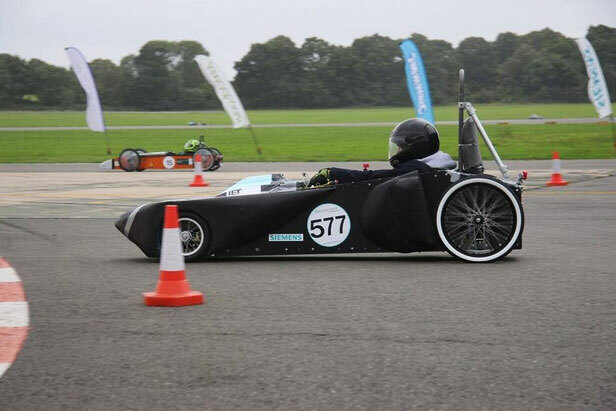 All Greenpower cars must have the same 24V electric motor and batteries but there is a lot of scope for individual design so long as each car meets strict regulations such as provision of seat belts, roll bars and a full-face helmet for the driver. With just 2 weeks before the race, the chassis, wheels and drive train were in place but we still had a lot of work to do with the electric transmission. Three days to go before race day and it was time to test the brakes, turning circle and steering. We took the car to the college netball courts for a 'push test'. Everything looked good so we now had to get the bodyshell attached and the throttle connected to control the motor. The car was now the subject of intense work for the next two days until late on Saturday afternoon we loaded the car and tools into our college minibus ready for the trip to Dunsfold and all fingers crossed that we'd be able to get last minute problems sorted out on the day. 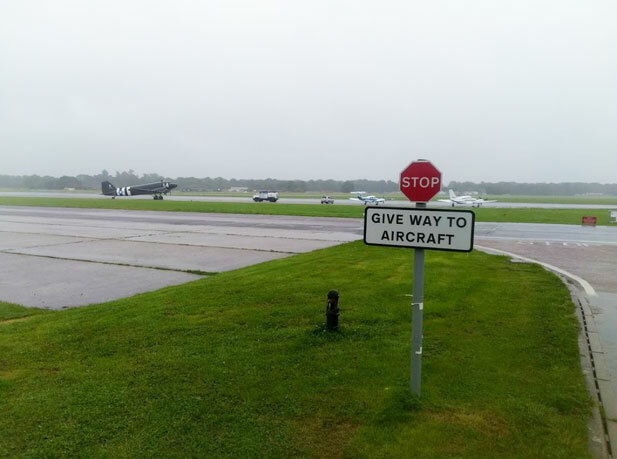 We left BHASVIC at 6am on Sunday morning, arriving at a misty Dunsfold Park aerodrome an hour later. This is the motor circuit used by Top Gear! The morning was spent assembling the car and wondering if we'd actually make it past the 'scrutineering' stage. Each car is checked against the regulations, about 30 separate checks. We managed to pass 27 checks on the first inspection and there was just enough time to pass the final 3 checks before our heat started, thanks to some great help from Phil Edwards and a neighbouring team. Our car was ready. We collected our race number and got the car ready to race. To have got this far felt like a great achievement but just as we were about to take the car to the start line, we suffered a major setback – a component in the steering snapped. A frantic effort ensued to make a replacement part and we finally got the repair complete in time to enter the race. 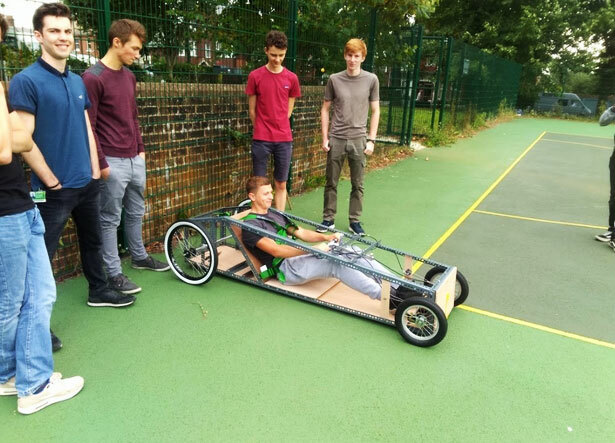 After spending so many hours over the summer working on the car, we were determined to see it complete the course and there was a huge cheer as it came around to complete its first lap of a Greenpower heat. How did we do? 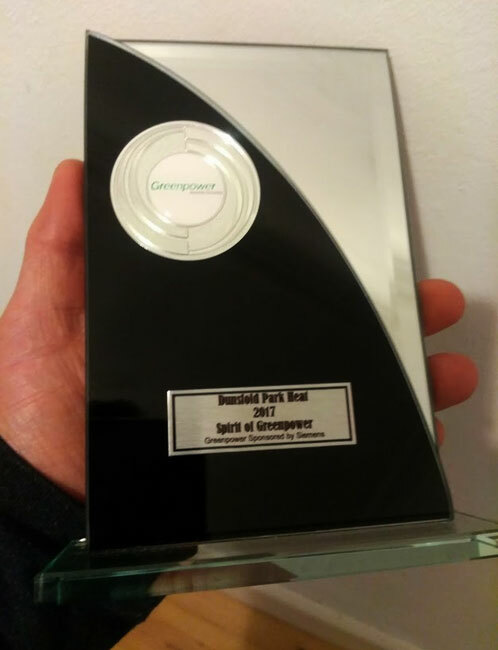 Well we didn't come last but our last minute efforts to get the car ready were spotted by the organisers and we were awarded the Spirit of Greenpower trophy at the awards ceremony. 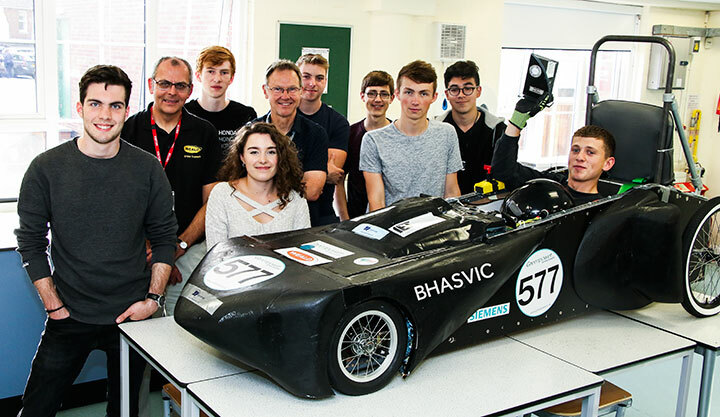 With our car now built, the existing team will be making a list of recommendations before handing over to a new team from our current first year students. The aim is to improve the car and then enter it into several more Greenpower events for the 2017-18 season. It would be great to reach the finals this time next year. If you would like to sponsor our car during the 2017-18 season, please get in contact by emailing p.golton@bhasvic.ac.uk. Help is always needed with tools, transportation, materials and so on. Any support would be greatly appreciated and we could feature your logo on the car!